Russian State Agrarian University - Moscow Timiryazev Agricultural Academy (RSAU – MTAA or RSAU – MAA named after K.A. 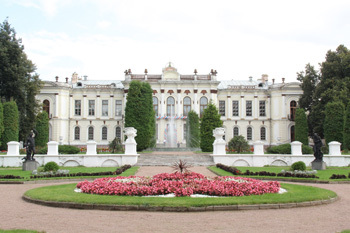 Timiryazev) is the oldest and internationally renowned institution of higher education in Russia. In 2015 the academy has celebrated its 150th anniversary. On December 3, 1865 by Imperial order of Emperor Alexander II the Petrovskaya academy of Agronomy and Forestry was founded. Opening of the first higher agricultural educational institution was a response for those current challenges. Russia was badly in need of experts being capable of organizing scientific based agricultural production; such professionals could only be trained at a specialized institution. Over its 150 year history RSAU – MTAA has formed leading Russian schools of agricultural sciences and higher agrarian education, its academic and teaching staff has attained international and national fame making the top of higher agricultural education. An integrate system of national agricultural educational and research institutions has been created on the basis of the university structural units. Nowadays the university serves honourably in the line of its historic mission and is most emphatically the leader of the Russian agricultural education. Currently university role has increased greatly. In April 2014 Moscow State Agroengineering University after V.P. Goryachkin (GMSAU) and Moscow State University of Environmental Engineering (MSUEE) were reunionized with RSAU – MTAA. For a century and a half over two hundred thousand highly qualified specialists have been trained both for domestic and cross border agriculture, several thousands of teaching personnel for secondary agricultural education have been prepared intra muros RSAU – MTAA, GMSAU, MSUEE. More than 20,000 master's and doctoral theses have been defended successfully. Thousands of foreign citizens from Europe, Asia, Africa and America have completed their training at the academy. sustainable development of rural areas. different centers, complexes, divisions, offices, laboratories, studios and other units. There are undergraduate, graduate and post-graduate programs based on full-time, part-time and intra-extramural forms of study at the academy. Over 15365 students study and master progressive, non-waste, energy saving and environment-oriented technologies; Economics, business organization and management, Accounting and Finance under market conditions; basics of foreign economic enterprise activity, Marketing and agribusiness with extensive use of economic and mathematical methods and IT technology in our University. RSAU - MTAA is at the head of the Russian high school educational and methodical association on Agronomy, Agroengineering and Environmental engineering and Water management. University staff makes a vital contribution to the development of agricultural science, fundamental and applied research in the field of agriculture and other sectors of agribusiness. Demand for university investigations is confirmed by high volume of research-and-development activities. Every year the University employees receive more than 100 intellectual property patents and licenses. Year over year more than 40 international, national scientific and practical conferences, symposia, seminars and competitions are held at the premises of the university. Having extensive international contacts the University realizes more than 80 cooperation agreements with partners in Europe, Asia, Africa and America. In 2008 according to the Russian Federation Presidential Decree the university was put into the National Corpus of the most valuable objects of cultural heritage of the peoples of the Russian Federation. In 2009 it was granted the status of the basic organization of CIS member states on training, advanced training and staff retraining in the field of agricultural education.